Robert F. Trager is an associate professor in the political science department at the University of California, Los Angeles. His research focuses on how states form beliefs about the intentions of other states, and in particular on the role of diplomacy. 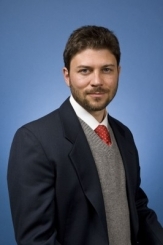 He also works on the determinants of coercive success and international terrorism, and has published in International Security, The New York Times, Foreign Policy and The Political Methodologist. He is currently at work on a book entitled Diplomatic Calculus in Anarchy. Before joining UCLA's faculty, Professor Trager taught at Oxford University and held an Olin Fellowship at Harvard University. He received his BA from Middlebury College and an MSc from the London School of Economics. Before beginning his PhD at Columbia University, he worked in the Investment Banking Division of Lehman Brothers in New York. His research has been supported by the National Science Foundation, the Eisenhower Institute, the Public Policy Consortium, the Columbia University Center for Conflict Resolution, and the Institute for Social and Economic Research and Policy.